J 7.01 Now Playing in your Browser | Analyze the Data not the Drivel. Big changes are afoot for J programmers. With the release of J 7.01 JSOFTWARE has taken the risky step of deprecating two well established user IDE’s and replacing them with brand new GTK and Web browser-based interfaces. As we all know new software is not necessarily better software, (remember that risky bit), but in this case the changes make sense. Early J systems were largely Windows-Centric. Yes, J has run perfectly well on strains of UNIX/Linux and the Mac for over a decade but I think it’s fair to say that J IDE’s were biased toward Windows. JSOFTWARE was well aware of this and tried to offer the features of their Windows IDE with a portable Java based IDE. Unfortunately the Java IDE, like Java itself, failed to live up to expectations. Now that the many, if not the majority of J programmers, run J on non-Windows, (mostly Linux and the Mac), systems it makes no sense to treat them like second class citizens. So how do you provide a state of the art portable user IDE that runs well on Windows, Linux, the Mac, smart phones and various IGadgets. There is no single answer so JSOFTWARE wisely decided to offer two IDEs: JHS and JGTK. The JGTK IDE is a desktop application that is similar to the older Windows IDE. JGTK is somewhat biased toward Linux but this his doesn’t mean it doesn’t work well on other systems. I run it on WinXP and Win7 machines all the time. JGTK takes longer to load than the older Windows IDE but once it’s up and running I don’t see significant performance differences. The JGTK editor is superior to the older Windows editor and I love the side bar and UNIX style code tagging. For a first version JGTK is a nice bit of work that will only improve as J programmers and users pound away on it. JGTK is nice but JHS is radical. JHS abandons the desktop and turns your favorite web browser into a stripped down J programming environment. I was skeptical when I first heard about JHS but it has won me over. JHS is amazingly effective under Google’s Chrome browser. It comes up in a flash and is as zippy or faster than the older Windows IDE. Even better this webby goodness imposes minimal burdens. 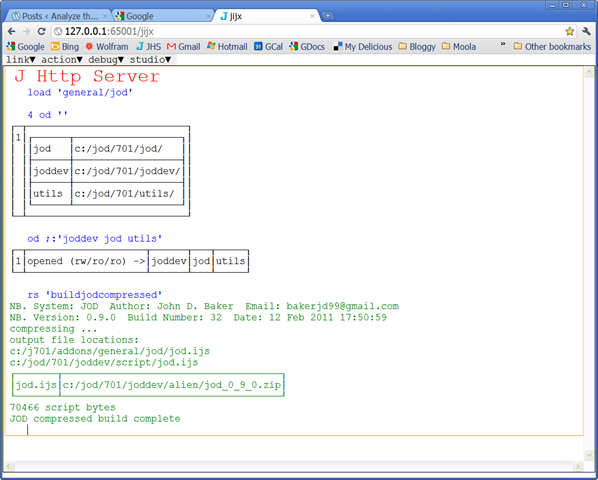 The JHS web server is often one of the smaller processes running on my machines. I have been doing the bulk of my JOD update work with JHS and I frequently forget I’m using a browser! Good user interfaces, unlike politicians, get out of your face! As for my J addon JOD: J 7.01 introduced a number of system script changes that break JOD 0.8.0. I am working on JOD 0.9.0, (a beta version is available in the files box sidebar of this blog), that fixes these problems and implements some planned changes. The biggest change so far: I have moved the JOD interface out of the z locale into it’s own ijod interface locale. How’s this for a marketing slogan? JOD 0.9.x – now with less z stomping! This entry was posted in J, Programming, Reviews, Software and tagged GTK, J, JGTK, JHS, jsoftware by John Baker. Bookmark the permalink. I tend to agree with you regarding the radical approach of the JHS option. It is quick and flexible. The real power may become more apparent as HTML5 code becomes incorporated. I was a little surprised that JSoftware did not go all the way to make the JHS an HTML5 from the start, but perhaps we shall see that in a future version. It is not a difficult step from what I have seen so far. Pingback: JOD comes to Linux « Analyze the Data not the Drivel.